UNESCO's Global Action Programme (GAP) on Education for Sustainable Development (ESD) is annual essay contest. 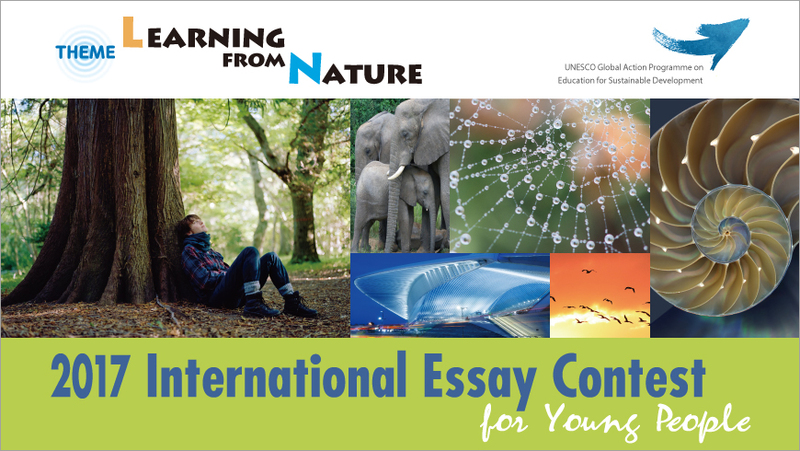 The topic of the essay is "Learning from Nature". The details of the contest can accessed via this page. There are two categories of contestants. The first is for children up to 14 years old, and the second is intended for youths, aged from 15 to 25 years. The essay must be in English, French, Spanish or German and contain 700 words or less. The deadline for submissions is on 15. of June. As an added incentive, 1st prize winners in their respective categories will be invited to the award ceremony to be held in Tokyo, Japan on November 25, 2017 and will receive the Minister of Education Award. The contest is organized in an effort to harness the energy, creativity and initiative of the world's youth in promoting a culture of peace and sustainable development. It also aims to inspire society to learn from the young minds and to think about how each of us can make a difference in the world. This contest ties in well with the goals and values of Global Citizenship Education, as explained and actively discussed on Global Citizenship Education working group. Please feel free to join the discussions! RSVP for UNESCO's International Essay Contest for Young People to add comments!